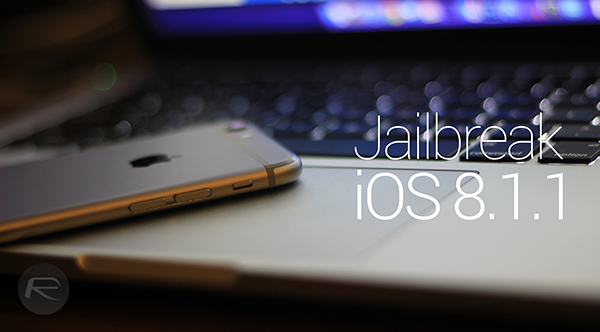 As you’ll likely have heard by now, the TaiG iOS 8.1.1 jailbreak tool has offered an untethered jailbreak for those running the very latest iOS 8.1.1, which is somewhat miraculous given that Apple only rolled the software out a fortnight ago. 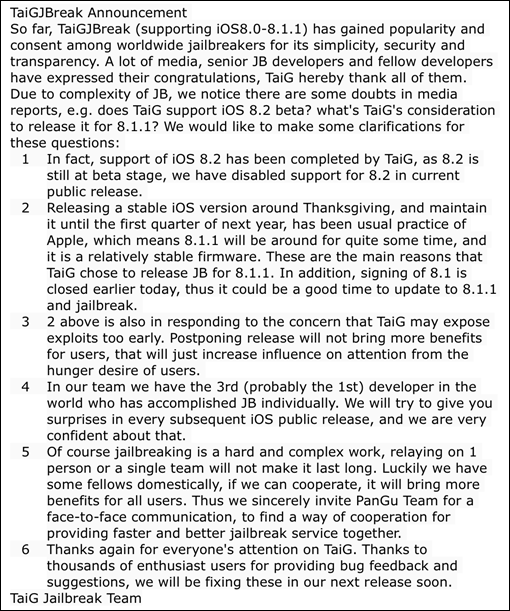 Now that the dust has settled and presumably thousands of iOS device owners have gone ahead and jailbroken their devices, TaiG has released a statement clarifying its new tool, as well as alluding to potential collaborative ventures with the famed Pangu team. First and foremost, the statement notes that while support for the currently-in-beta iOS 8.2 is something that the team has worked on, the feature for jailbreaking the unfinished software is disabled in the current TaiG public releases. This seems to imply that when iOS 8.2 does hit the OTA, we may have a jailbreak right off the bat, although presuming the exploits used are the same as those found in iOS 8.1.1 – extremely likely, of course – it does appear that TaiG’s decision to hold back on iOS 8.2 beta support might be rather inconsequential. TaiG also makes a note of the timing of this jailbreak, which many considered to be strange given that iOS 8.1.1 download is only a minor bump on the jailbreakable iOS 8.1. But as the team rightly notes, iOS 8.1.1 is likely to be around for a while before iOS 8.2 is made public, and given that it’s a fairly stable release, now’s an ideal opportunity for folks to update to iOS 8.1.1 and reap the benefits of Cydia tweaks once more. In addition, since Apple recently stopped signing iOS 8.1, the release of TaiG for iOS 8.1.1 means that those wishing to jailbreak are not stuck without an option to do so. The statement also reveals that the jailbreak was achieved by one individual within the team, which is an epic feat given the number of hackers and security experts constantly plugging away trying to pick holes in Apple’s software. Sensibly, though, TaiG extends an arm and invites Pangu to a face-to-face communication, and with these two now-revered Chinese firms working in tandem, it would be to the immense benefit of the jailbreaking community as a whole. The piece concludes by thanking community members for their help in reporting bugs and other such issues, as well as the general attention and excitement that has surely made it all worthwhile for the TaiG team. As a long-time follower of the jailbreaking world, I have witnessed some ups and downs, and at the moment, we’re definitely in the midst of the good times. Having once waited months, almost giving up hope of a jailbreak ever occurring, we’ve now had four jailbreaks in less than a year, and what’s more, the whole idea of those tedious "tethered" jailbreaks seem about as dead in the water as the Netscape browser. If TaiG and Pangu can find a way of working together rather than as prospective rivals, the frequency and quality of jailbreaks is beckoned to improve, and although we’re looking forward to potential Mac support and are hopeful of an immediate break for iOS 8.2, the real win would be if these two modern giants of jailbreaking can pool their skill sets and operate as a team. Hi, i just try to access Taig webpage and my antivirus block the site. It contains a malware. Is safe to hack the iphone with that? Probably its the best phase of JB’s. I’ve been jailbreaking my iDevices since 2009/10 and what I notice now is that everything has been made amazingly user friendly and the JB community is not dependent upon a single team. The competition amongst the various groups has had an added advantage for jailbreakers like me and a freaking bad time for APPLE! :p Cheers to every one who is a part of the JB Development team. Governments may be funding it as the un-jailbroken ones are pain in the backside with the encryption, so with this, they can backdoor the root access. Just a thought. Well i have done it, 2 of my friends have done it, literally thousands of other people have done it so I’m pretty confident its safe and malware free. I remember what it was like to jailbreak OS 1.1.2 and OS 1.1.3. That was so much fun. Now all the jailbreaks are a one push button jailbreak so easy any one can do it. No real challenge anymore. They r my true heros and always trusted!! But if I’m not mistaken, everyone u just mentioned at the time of the evasion JB actually started calling themselves as a group… EVADERS!!! And it’s not at all a bad thing for Apple either–they only imagine it to be. Anyone else having problems with the App Store not downloading and iTunes streaming? I understand a site that is still able to սոⅼοсking AT&T phones after AT&T denied the access of several սոⅼοсking sites to their database after the renew, which caused a variety of սոⅼοсkings not working anymore. The website is just google atttiphoneeuunloockiing, it’s undoubtedly one of the fastest ՍΝᏞΟᏟΚing site you can find on the internet nowadays.